A case with history of radiotherapy 12 months back for an inoperable Ca oesophagus. Details of radiation dose and fractionation not available. Now complaining of left side slowly progressive hemi paresis since last 3months. 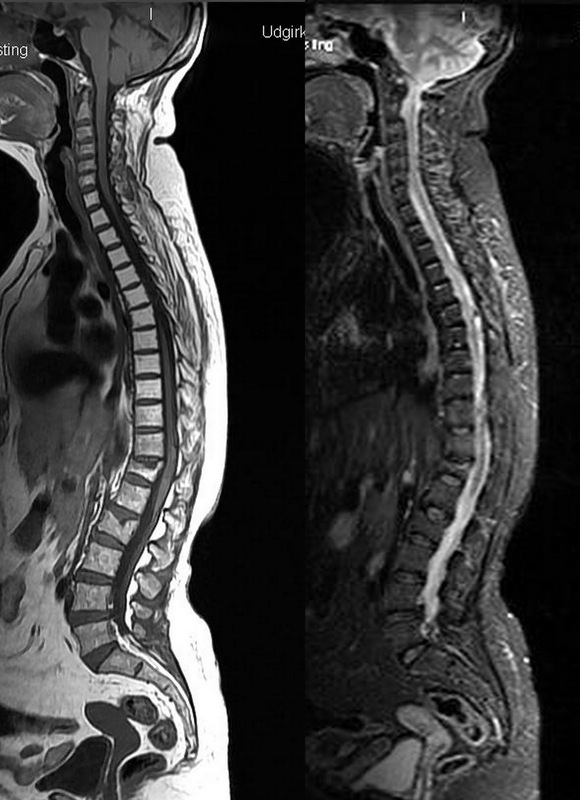 MRI Sagittal T1 and STIR screening of whole spine shows radiotherapy induced fatty marrow in cervico dorsal region, diffusely bright on T1 with signal suppression of STIR. Radio therapy is commonly used as a primary or adjuvant therapy for malignancies. Necrosis of adjacent normal tissues is one of the major complications. Radiation induced spinal cord injury is rare occurs when the spinal cord is included within the radiation field, high total radiation dose or high radiation doses per fractionation. First recognized in the mid-1940s, shortly after the introduction of megavoltage radiotherapy. There are three types of presentations of radiation induced spinal cord injury. 3. Selective lower motor neuron syndrome, rare. Most common, mild and transient form. Often seen after cranio spinal irradiation for primary CNS tumors, treatment of lymphomas or extra neural tumours of the head, neck, or thorax. Latent period of 1 to 30 months with the peak onset at 6 months. Characterised by paresthesia along spine extending down to the limbs. 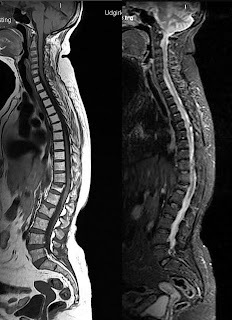 Spinal cord may be normal on MRI. Resolves gradually over 1 to 9 months. No obvious documentation of any additional risk for delayed myelopathy in the affected individuals. After latent intervals of 12 to 14 months. Presents with numbness in lower limbs followed by weakness and sphincter dysfunction. Pain is not a prominent feature. MRI may show changes in cord. A rare syndrome due to selective damage to lower motor neurons, anterior horn cells believed to be the primary site of damage. After latent period of 4 to 14 months. Slowly progressivey over several months and then stabilizes. Nobody would like to damage spinal cord but the difficulty is there is no precise threshold of spinal cord for radiation induced injury. The accepted or tolerated dose is again different and necessarily low in patients who receive a second course of radiation, concurrent radiation plus chemotherapy. Worrisome thing is patients with radiation myelopathy are permanently neurologically disabled and there is no proven effective treatment. 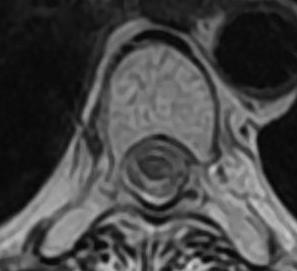 MRI of radiation myelitis: a report of a case treated with hyperbaric oxygen, F. Calabrò and J. R. Jinkins.